I know it’s only been a few months since I declared my decluttering mission to be over but I have to admit that I *may* be back on it. 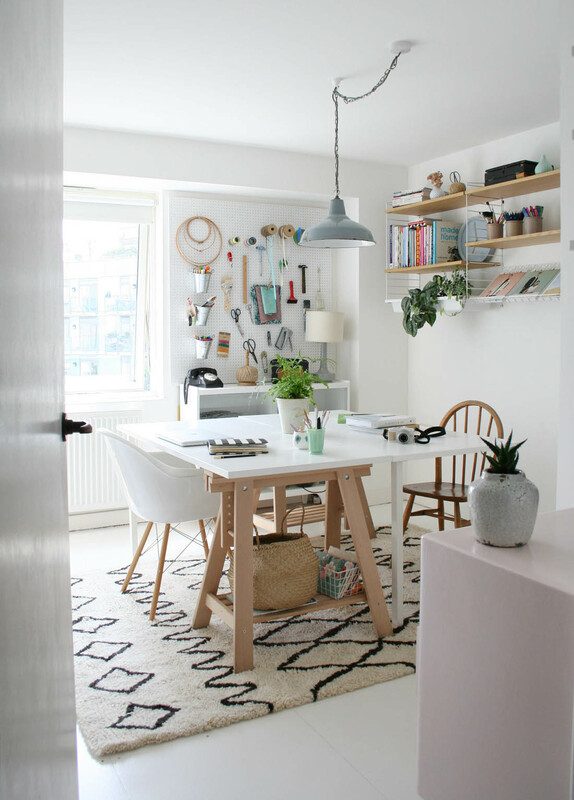 The problem we have is that our lovely home office, filled to the brim with craft materials, stationery, books and props has got to go – I know, I know! We will need to convert the room to a nursery in a few months time because even though we will have the baby in our room for the first few months we have nowhere else in our flat to store baby stuff and we want a guest bed back in that room so that family can come and stay (to help!). At the end of the day, my office has been a luxury and I will definitely be able to cope without it. I’m always at risk of stuffing everything I own under my bed but if at all possible try your best not to do this. If you have a bed, sofa or cupboard that is raised off the floor on legs you should always try not to store things underneath them as this will block out light and instead of light from your windows being able to travel freely around a room it will be adsorbed by all the nasty clutter. The back of a door in a room or the inside of a cupboard door is invaluable space to store things. Make as much use of them as possible. I have a set of hooks on the back of every door in our flat and because we always have the doors open you can’t even see what is stored on them. 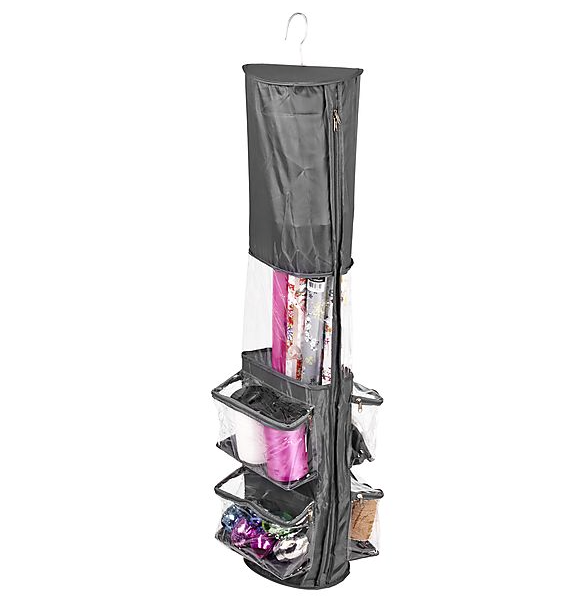 We also have a shoe organiser on the back of our hallway cupboard, our ironing board on the inside of another hallway storage cupboard door and every single kitchen cupboard has storage for pan lids, cleaning materials, foil and cling film or food. 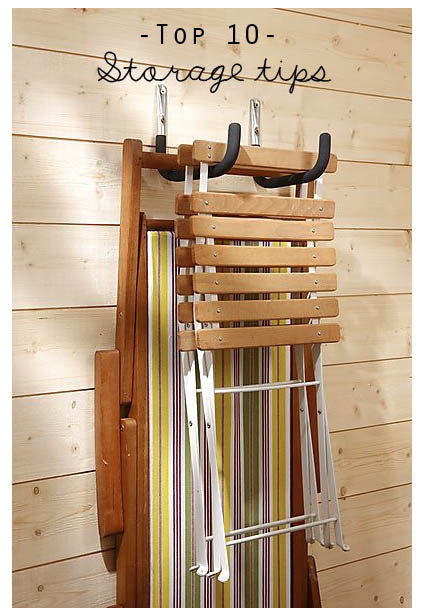 This hanging organiser would be perfect for some of my craft materials and could hang on the back of a door and will keep everything organised and easily accessible. 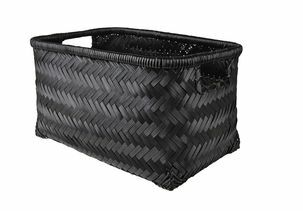 I have so many little bits and bobs in my office and the best way of storing those is in boxes or baskets that I can neatly store on shelving. 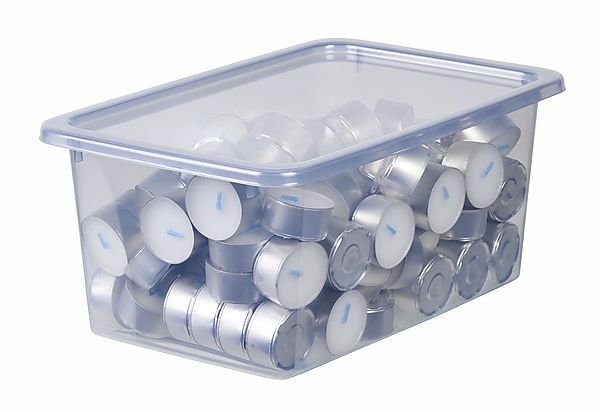 I always add tags or labels so that I know exactly what is in each box, which makes it easier to grab stuff when I need it. I think this is really helpful rule and easy enough to follow. 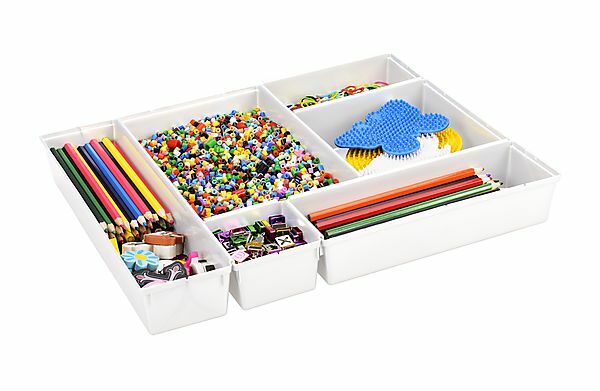 Don’t create storage boxes full of random bits and bobs that you’ve just thrown together; plan what needs to be stored and group things together in a thoughtful way. This will enable you to access your stuff much more easily. There are always going to be a few things (ok, maybe more than a few) that you want to keep but you don’t need regular access to. 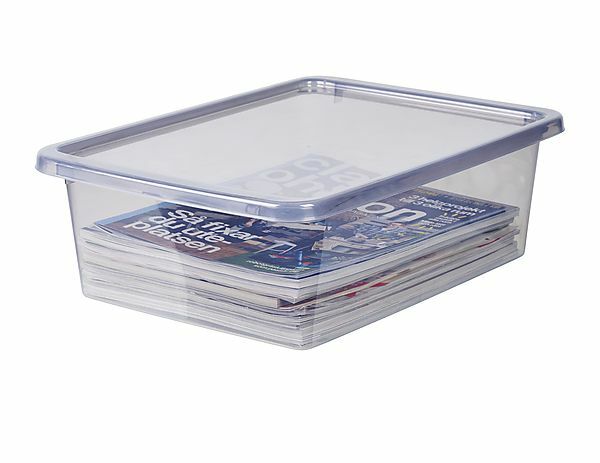 I like to store these things in transparent storage boxes that go in our large hallway cupboard. Being transparent means I can glance at them and know what is in each one and that way I don’t forget about things. I love a high shelf (I’ve written about them before here) and we have them above most doors in our flat. 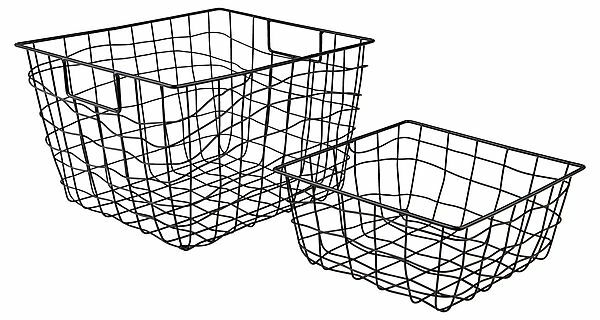 They don’t encroach on the space, they can provide a large amount of storage in otherwise wasted space and they are so easy to put up and cheap. 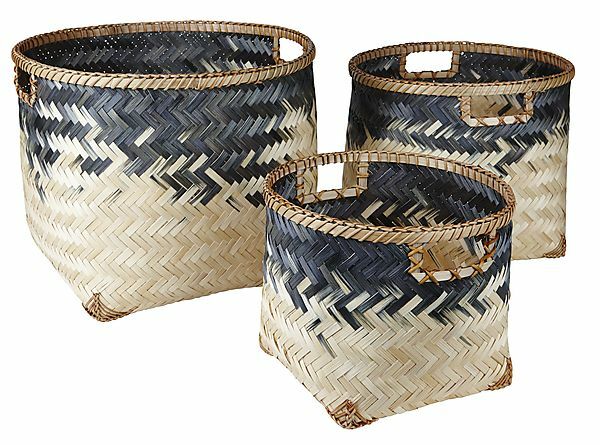 I LOVE a basket or ten and they are perfect for every room, every landing, passageway or corner that I can get them into to help collect those extra things that need a home – blankets, magazines, shoes, slippers, bags. 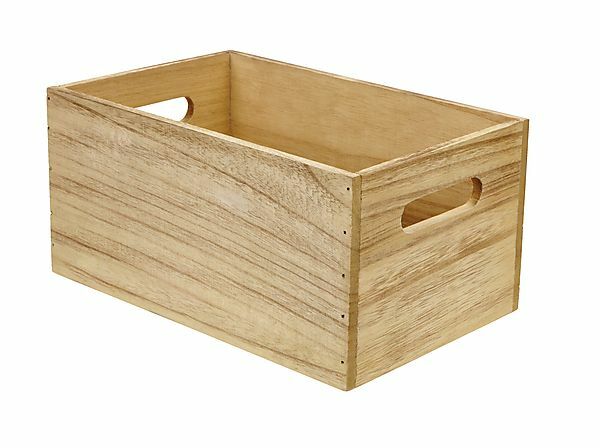 Inserts to help make the most of the storage space in drawers are a godsend and make a massive difference. There will definitely be a bit of vacuum packing going on around here as I need to make space in wardrobes so out of season clothes and spare bedlinen/duvets will need to make way. 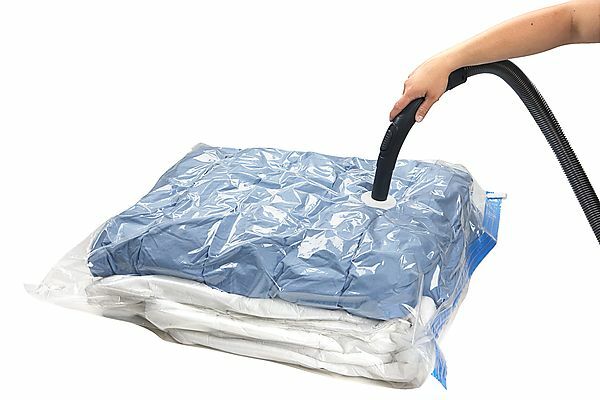 The added bonus of vacuum storage bags is that they keep clothes and linens protected from dust, damp and moths. 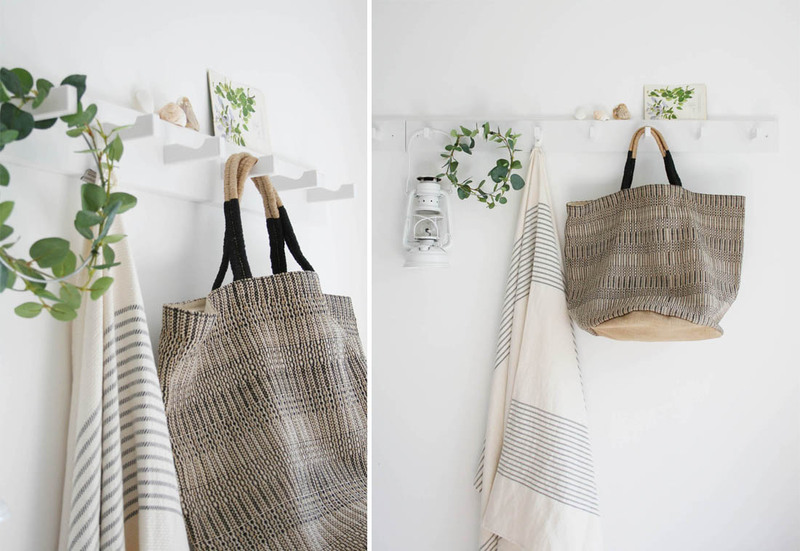 It’s all about using wall space rather than floor space. The more floor space you can free up the bigger and more spacious your home will feel. Don’t go overboard but do take a good look around and see if there are walls that could be working harder for you. I hope some of these tips may help you if you’re struggling with space. I’ll let you know how I get on when I start the job in a couple of months. 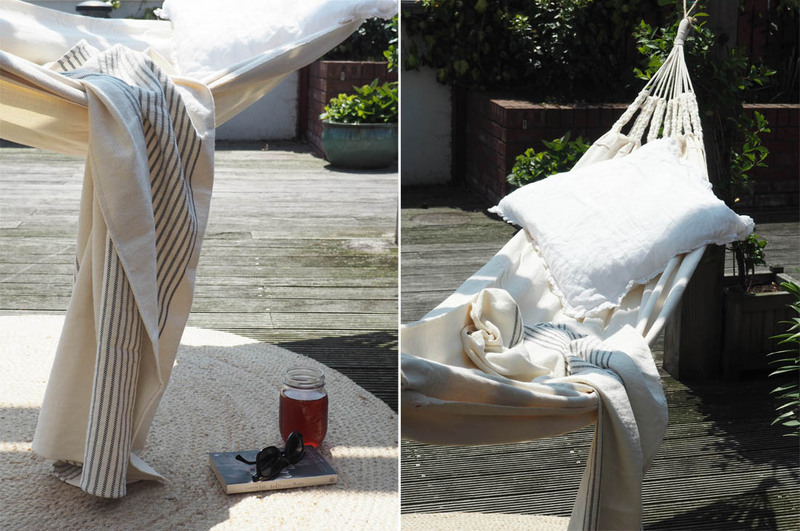 I know the weather this week isn’t looking great BUT I have faith the sun is going to be back soon so I can spend the rest of summer swinging in this luscious hammock from Urbanara. Seriously, just wake me up when Autumn begins! 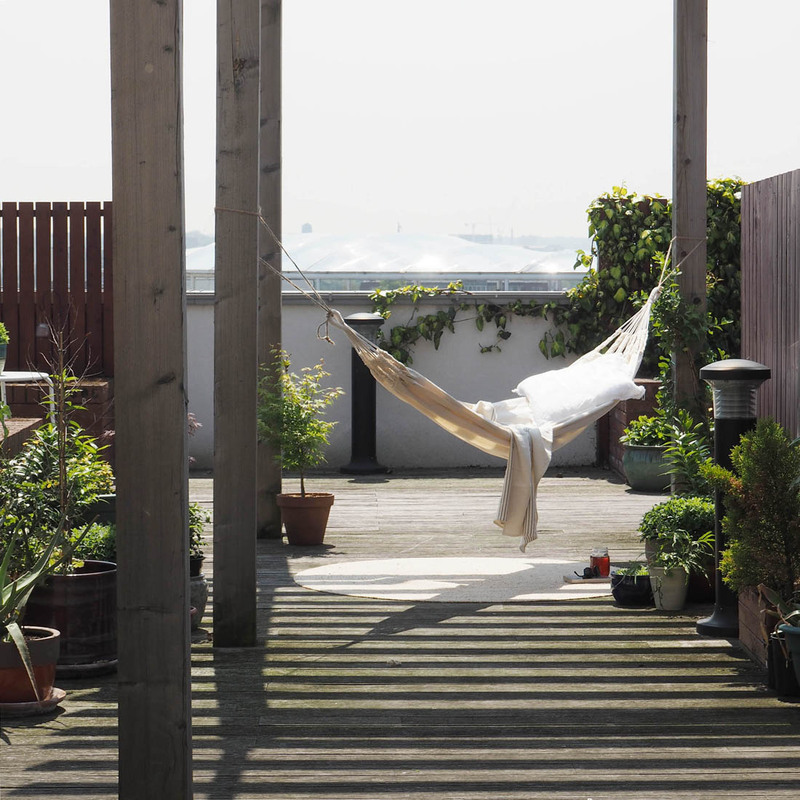 Our roof terrace is a great communal space that we share with our neighbours and it isn’t overlooked so it’s a great place to hang out, sunbathe or spend time with friends. 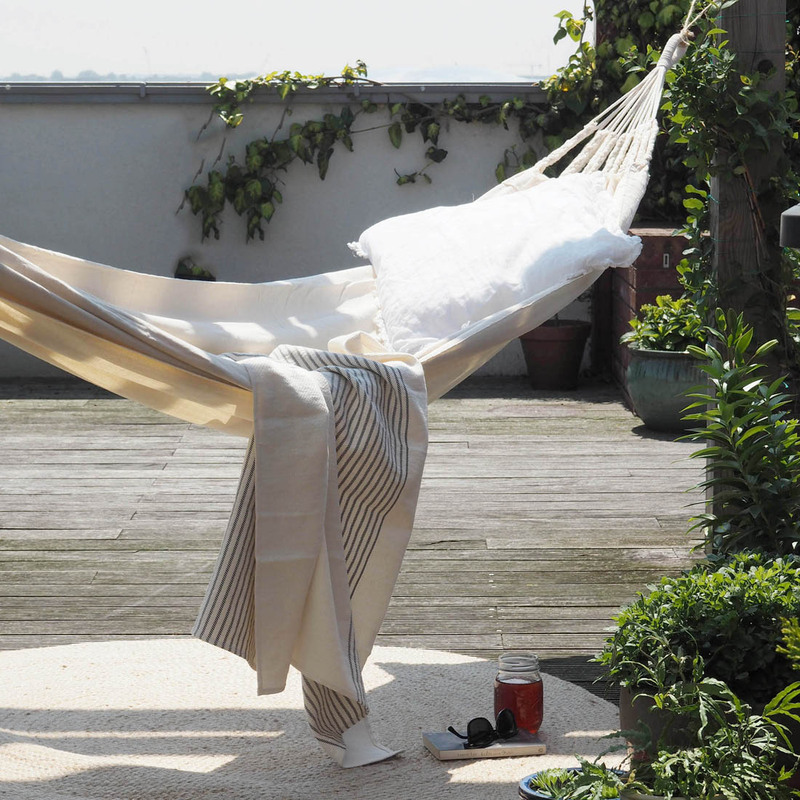 This unbleached cotton hammock is the perfect addition to the space that works really well with the weathered decking and green plants. I’m not keen on bright colours in the garden so the natural tones and textures are perfect for me. 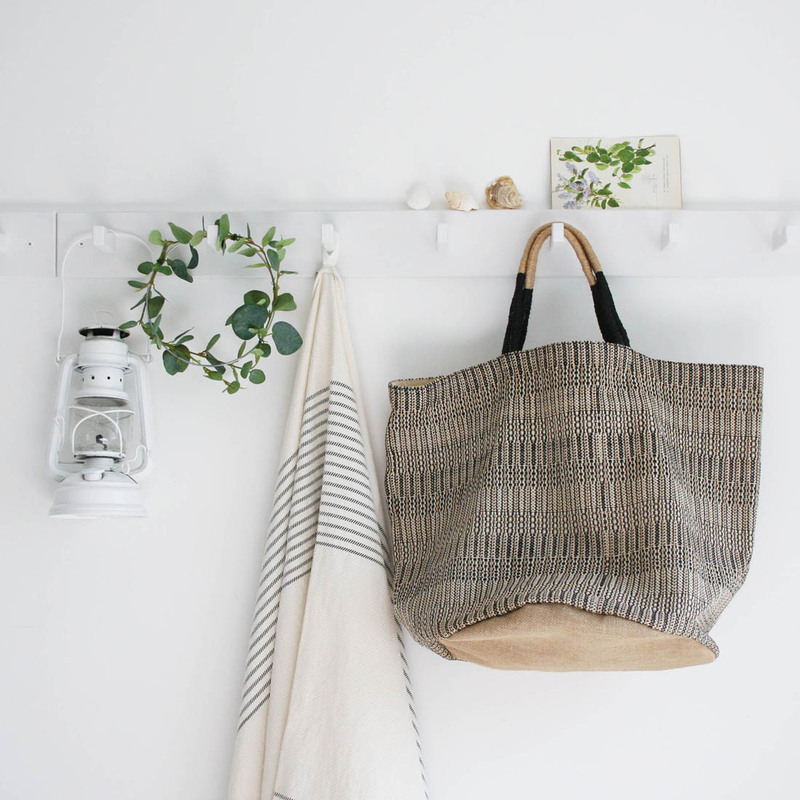 I also love this Hammam towel, which is ideal for summer to take to the beach, as a picnic blanket or as a light weight cover up when the evenings get a bit chilly. 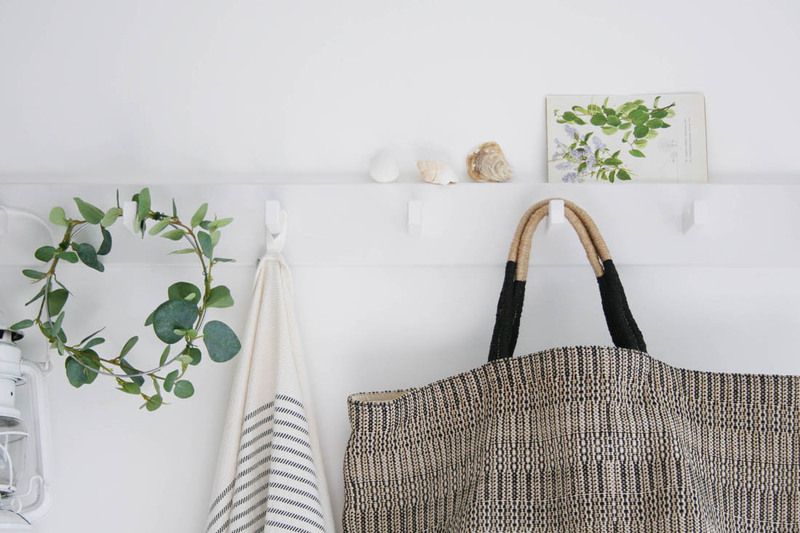 Summer is summed up by my peg rail right now…it’s all about sitting outside late into the night with lanterns, tending to my plants and flowers, going to the seaside and stuffing everything into a big, beautiful basket and spending all day outside and returning home with colour on our noses and sand between our toes. Right, I’d like to say I am heading up to the roof to enjoy this little spot but alas I may have to wait until the weekend for the sun to come out. Take a look at the rest of Urbanara’s brand new garden and outdoor collection – you’ll love it. *This post was written in collaboration with Urbanara. I have spent this week with my flat in complete chaos. 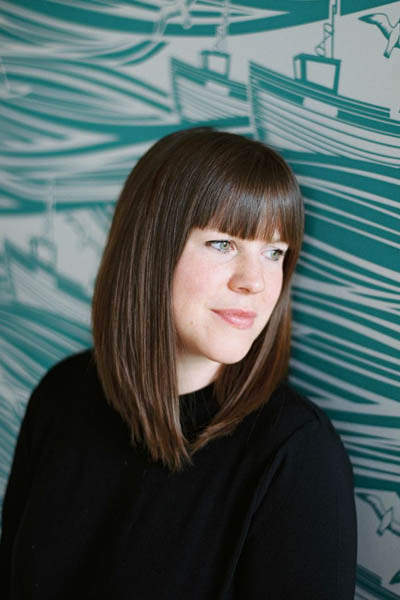 Katharine Peachey came to shoot my kitchen and living room so that I can finally share the changes I have made with you next week – hurrah! Around that I squeezed in some styling for Dwell to showcase a few of their lovely products in my home. 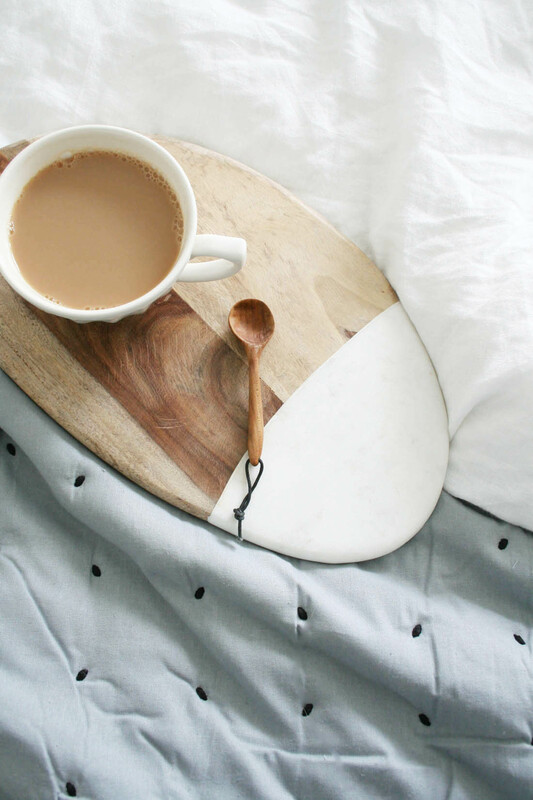 I think it’s a great idea to be able to see homewares in situ, especially if you like buying online like I do, as standard product shots sometimes don’t do the item justice. 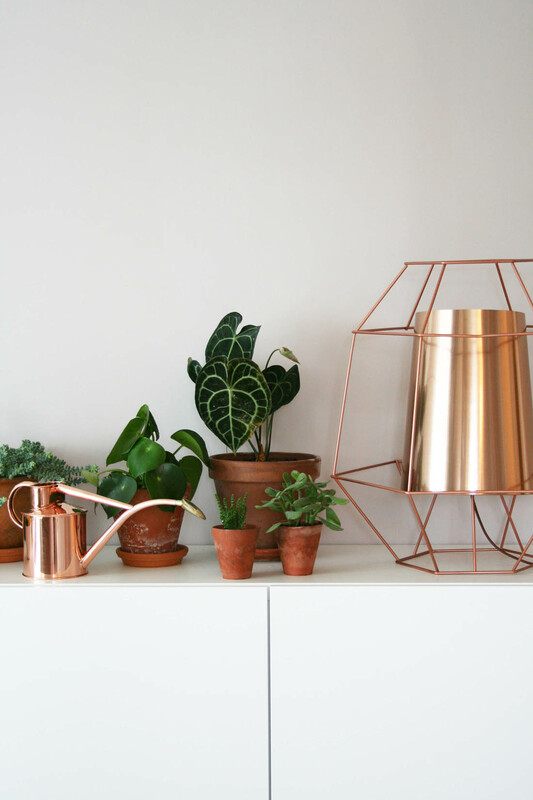 I chose a variety of accessories to show you, picking up on the current copper and blush trend with a copper table lamp, a beautiful wool rug (I have been lusting after one of these Berber style rugs since forever – gutted I can’t keep it!) and a few bits to add a different feel to my bedroom. My newly painted living room in Farrow & Ball’s Peignoir provides the perfect blush pink backdrop for this striking copper table lamp. 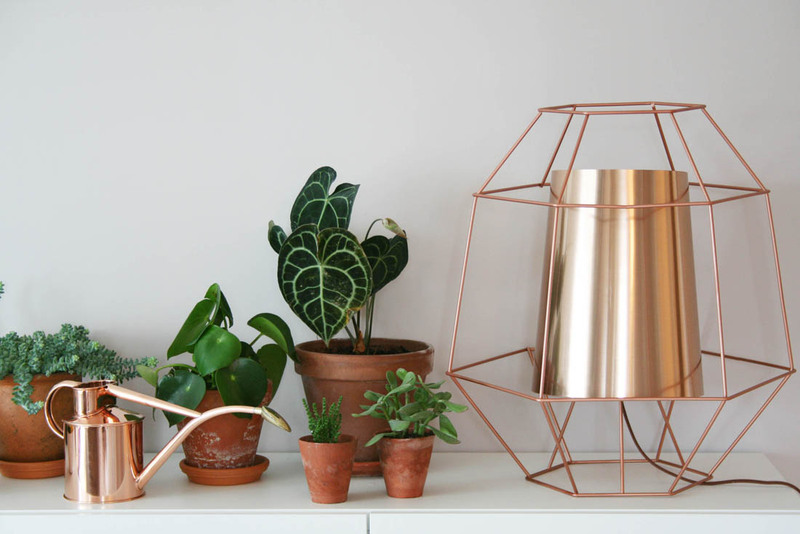 I love the combination of pink, copper and green plants. 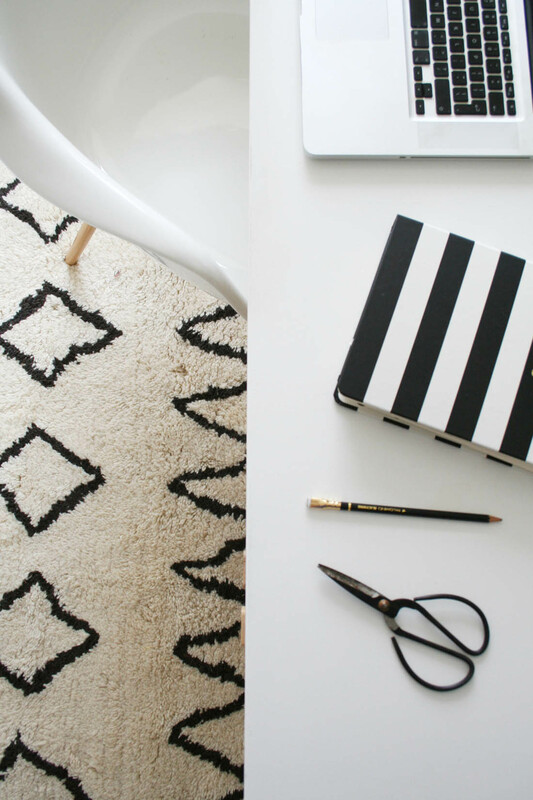 My home office seemed like the obvious spot for this gorgeous wool rug. If it was going to stay here permanently I would make it a monochromatic scheme and get rid of the blue accents. 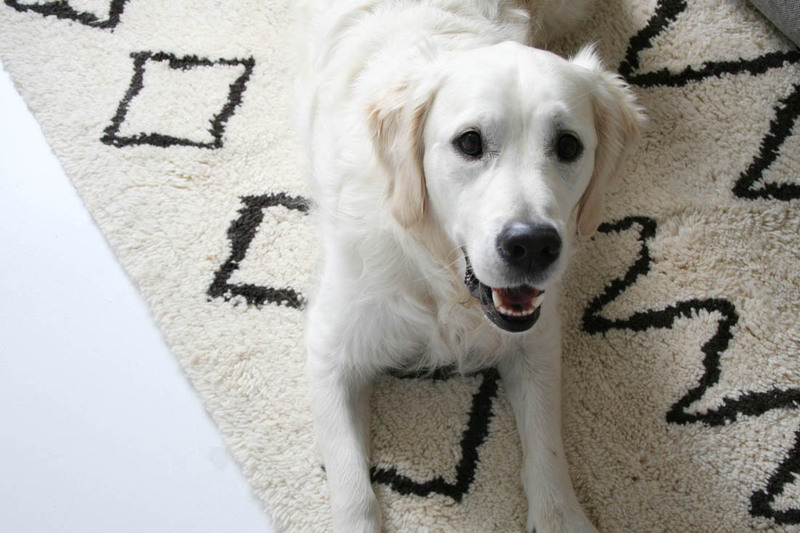 Alas, this soft, sumptuous rug is being collected today and even Otto will be sad to see it go! Sousse wool rug (this is the large size 160x230cm which is currently unavailable but will be back in stock soon). 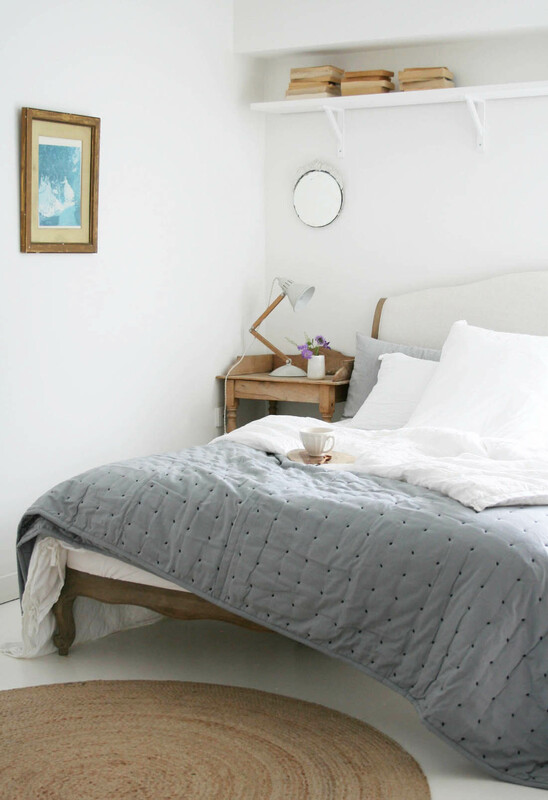 I fell in love with this grey bedspread when I did some in store styling for Dwell and it’s amazing how different my bedroom feels replacing the pink accents with this lovely grey. This colour is so calming and the quilt itself is so soft and luxurious. 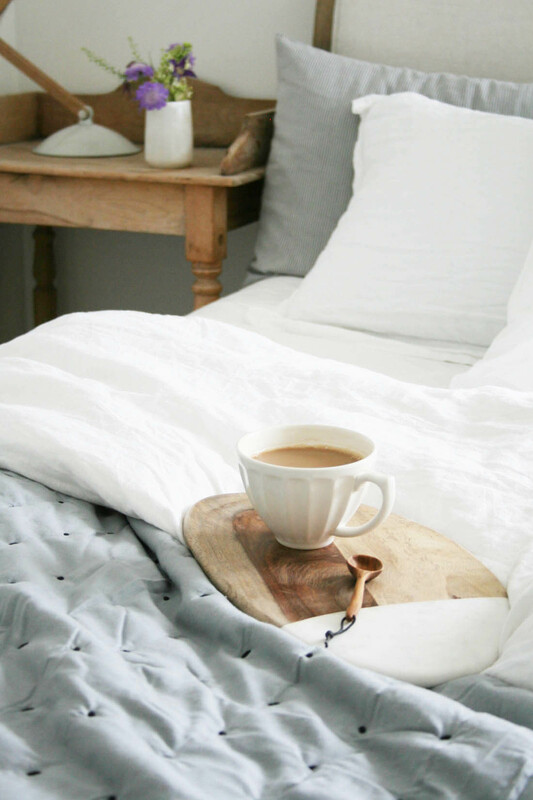 At this time of year I like to pack my feather duvet away and use a linen sheet and a quilt for the warmer nights. 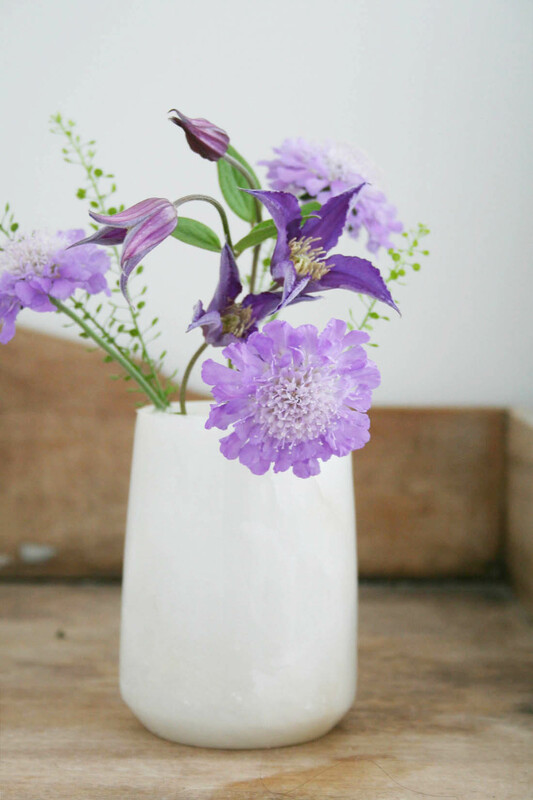 This lovely Alabaster pot is actually sold as a toothbrush holder but it makes a perfect vase or pen pot and the marble and wood board is ideal for tea in bed. It always amazes me how adding just one statement piece to a room can completely transform how it feels so I really enjoyed seeing the rooms in my flat look and feel totally different to me for a short while. It’s got me thinking…ok, I am promising to myself that I am not going to do anymore DIY or major changes for at least six months. After that though, you never know! *This post was written in collaboration with Dwell. I was spurred on last week after I wrote a post about adding the finishing touches to my living room. 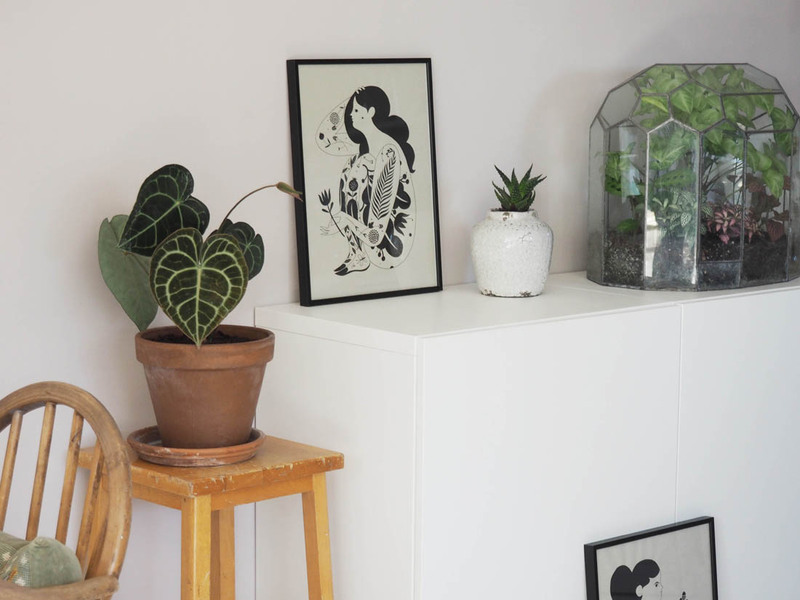 I bought a few new plants, re-potted others, framed and hung wall art and styled up a few surfaces – it is finally finished! I promise to share it with you soon (I know I’ve been rabbiting on about it for months now – you must all be very bored!). In the meantime I want to share with you two of my favourite additions to the room, which are a pair of prints from The Future Kept. 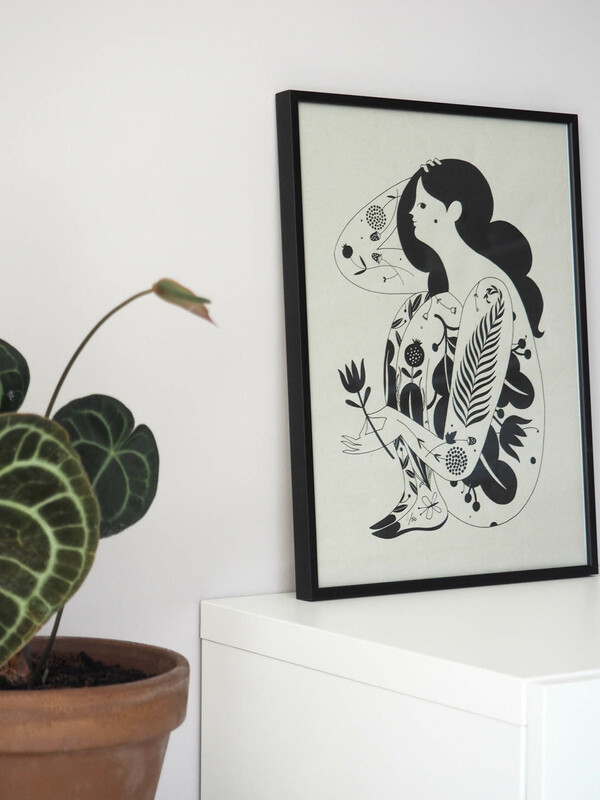 I don’t know about you but I find it incredibly difficult to find affordable wall art so these prints are a revelation and they are perfect for the room. Both goddesses seen here propped up ready to be hung. I have the Spring and Autumn Goddess, both made in collaboration with the artist Karolin Schnoor exclusively for The Future Kept. I love the seasonal designs and the black is a great way to add some contrast to an otherwise light coloured scheme: simple, beautiful and unique. It took me a while to decide how to frame the prints so I thought it might be a good idea to do a quick post about frames and hanging pics – will try to get that up next week.